CITY OF ATHENS is a non-narrative short film, a portrait of a changing Metropolis from filmmaker and award winning photographer Alexandros Maragos. The film is a homage to the capital of Greece. It features hyperlapse, timelapse and drivelapse cinematography of the urban area, the skyline and the architecture of "το κλεινόν άστυ" / the glorious city. Shot almost entirely from the highest rooftops, hills and mountains at night, the film explores the urban core, the city center and beyond. CITY OF ATHENS was shot exclusively with the use of various timelapse techniques over a period of 90 days. The hyperlapse technique was used in a very subtle way to simulate the camera movement of long dolly shots, tracking shots and helicopter shots. The short film was made out of 60,000 raw images in 5K resolution and it was shot on the Canon 5D Mark III with Canon L-Series Lenses mostly at 200mm and 400mm. Editing and grading was done in Adobe Premiere Pro and Adobe After Effects. The film was finished for the web at 1920x870, 2.20:1 aspect ratio. Music is by Tony Anderson. CITY OF ATHENS was released online for free on Feb 20, 2018 simultaneously on Vimeo and YouTube. On Feb 23 it also became available on Facebook. CITY OF ATHENS received widespread critical acclaim and it was praised for its visuals. The film received a large response upon release, receiving over 200,000 combined views within the first 48 hours on Vimeo (110,000 views) and YouTube (90,000 views) and appeared simultaneously on the Trending Lists of both platforms. A week later the film surpassed 300,000 combined views. Excerpts of the film aired by major GR broadcasters including SKAI TV, ANT1 TV, ALPHA TV, ERT as well as Euronews in Greece, UK, France, Germany and Portugal. Lonely Planet's Maeve Heslin wrote: "The short film, made up of some absolutely epic hyperlapse and timelapse footage, presents the city as a buzzing metropolis where old and new dramatically come together". 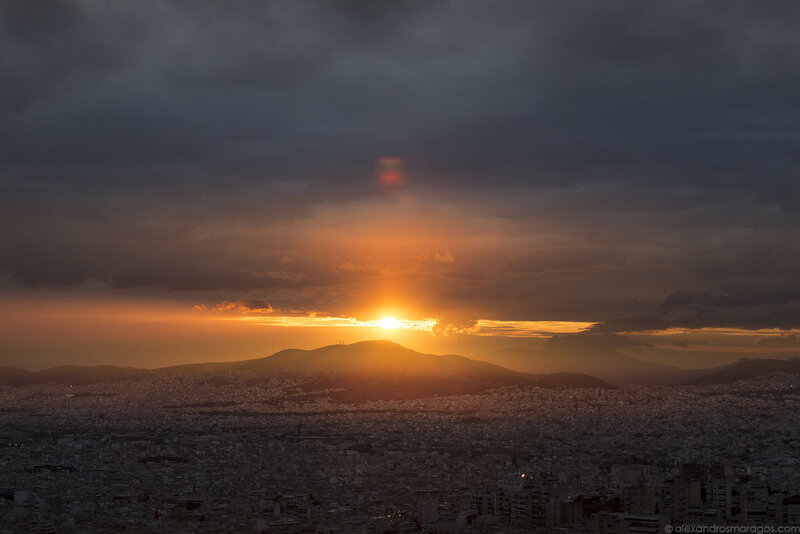 Talia Avakian of Travel + Leisure wrote: "This time-lapse video of Athens is even more breathtaking than you’d expect", while Sadie Whitelocks of the British Daily Mail wrote: "Mesmerising timelapse footage showcases the sweeping beauty of Athens in all its glory". The film screened in some of the most important cultural venues in Athens including the Onassis Cultural Centre where it opened the ESW Conference, Greece's largest conference in Architecture and Design and the Cultural Center Hellenic Cosmos during the annual ceremony of the Tourism Awards. motivates a deeper understanding of the mystic, lucid and fluid notion of a metropolitan dream. He suggests a constant hymn to the urban condition"
"Alexandros Maragos has managed to capture all the beauty and atmosphere of the city in just five minutes"
"Visual blast of Athenian echoes! The most impressive film about the city of Athens"
to catch the pulse of the Greek capital, the glorious past and the bustling present, in less than five minutes."